Nick Howard, the first pick by the Reds for the 2014 draft. 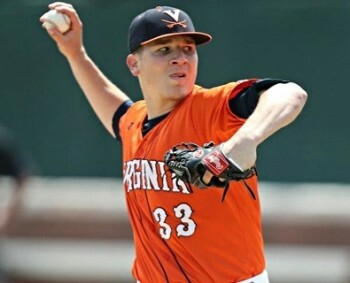 The first round of Major League Baseball’s 2014 amateur player draft happened yesterday, and Jesse Spector of The Sporting News graded each team’s selections. Spector begins with a disclaimer. Here’s the thing about draft grades, though: 10 years ago, the draft featured eight first-round picks who never played a day in the major leagues, including No. 1 pick Matt Bush and No. 8 Wade Townsend. Mark Reynolds, a three-time 30-home run hitter, went in the 16th round. What follows, then, is a series of grades that are stupid, but that also come with the knowledge of their stupidity. And how did the Reds do? Nick Howard (No. 19) is part of the Two First Names Club, so there are some people who will not trust him, but this is part of the Reds’ philosophy, as they selected Philip Ervin in the first round last year. Hopefully he’ll be able to avoid Tommy John surgery. Stanford shortstop Alex Blandino (No. 29) is the compensatory pick for Shin-Soo Choo, so, hey, no pressure, right? Yay! The Reds got an “A”! I’m sure we’ll all look back on this grade in 10 years time and nod with satisfaction. Especially if Howard avoids Tommy John surgery.